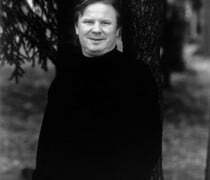 A contemporary of Magnus Lindberg and Esa-Pekka Salonen, the composer Jouni Kaipainen died this morning, a day before his 59th birthday, after a long illness. He leaves 4 symphonies, 9 concertos and 7 string quartets, a legacy that is widely respected across the Nordic lands. The conductor Hannu Lintu writes: Jouni was a true artist with deep understanding of human nature and respect for tradition. His musical intelligence, imagination, ear and technique were unique. I knew him from the very beginning of my career and could always trust his support and opinions. There was and will always be something to learn from his scores, texts and thoughts. Thanks for your music. Sleep well, my friend. A highly original composer of great music. Must dig out his records again. During the thirty or so years I knew Jouni, he evolved from being a very fine composer to being one of the very best: his Third Symphony is a towering masterpiece. Only in September I had an e-mail from him outlining what he had ahead of him, in terms both of music and of illness, and I quote some of it here, since it reflects something of his personality: “I have, already, also been working on the next projects, which include truly major compositions: a marimba concerto, a whole-night puppet opera, the first one in this genre ever done in Northern Europe and one of the first in Europe, plus my fifth symphony, commissioned by the Finnish RSO and Hannu Lintu. […] Please forgive me for being so eager to tell about all of this. I just want you to be informed! Some people have asked me, if there is any sense in trying to work on so many different big things in my condition. No wonder, it is a good question. But this is how things just settled for me, and I found no reason heavy enough to give up something (what would it be then? how to choose?). Besides, there is this extremely important factor: working makes me feel much better, it keeps up the spirit! When I compose, I do not think about being ill, about suffering, about eventually dying…”. And even with all that on his plate, and the plate itself shrinking in size by the day, he still agreed to my request (made in initial ignorance of his condition) to write a piece for string orchestra in memory of my fiancée. Since she too died of cancer, it was for him an act of defiance. This is a wonderful post, Martin. Thank you for sharing this personal experience with us!